The last day of October was quite unpleasant with dull weather ending in rain which does serve to dampen all but the most lively spirits. Nonetheless, the brave teams struggled on and achieved fishplate greasing between the north and south turnouts at Shottle after some of the group transported more grease to site with the road/rail Landrover. 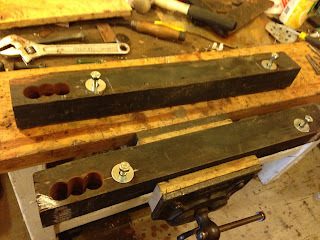 The other PWT members continued the construction of lift fishplates. This is quite technical as it requires conventional fishplates having metal strips welded to them to deal with levels of worn rail when they are added together allowing for the smooth passage of our trains. The LCC cleansed the Royal Saloon after its adventures on Friday and Iris that will be the mainstay of our winter services. The Filing Fairy was in go mode as we get ever closer to evidencing that everyone involved in the organisation has the right qualifications. I know some of you find this quite boring but it is mandatory to enable us to stay in business. It was good to welcome a test track customer, albeit a modest one, after a period of famine in this area of our enterprise. The Booking Hall kept on top of Santa bookings but there were lean pickings for the Pullman Buffet Car. I am reminded that there are still many vacancies for the Santa trains that are all accessible on the web site - www.e-v-r.com/rota - it is very important that the Santa team know in advance who is going to help. Turning up on the day does not give too much comfort that all bases are covered. As the month draws to a close we had the first of our two half term service days which was quite surprisingly successful and provided Iris with some quite useful loads through the day. The DST conducted a firemans training day declaring two candidates as fit to hold this honoured role and we welcomed Fred & Iris who gave the Mess Hall their customary deep clean that is always necessary with a DST day. The PWT concentrated on track patrols for the whole line discovering a belt from one of the dmu cars that was shed during the weekend. However, the dmu team had picked up on this loss and concentrated today on the panel lights of the Class 117 reporting success from their mission. The VCT were somewhat restricted by the train operations but managed further clearance south of Hazelwood encountering dense blackthorn but achieving two very large fires. The Booking Hall welcomed our passengers today, received more Santa bookings and placed onto the web site another first! 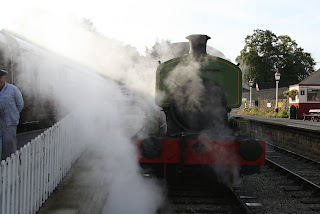 On line Sunday Lunch bookings as a trial run for the Santa train period with the first offer available for this coming Sunday. My thanks to Robin and Leigh for reacting quickly to this new adventure and Angela for putting all the components in place to see whether we can break into the Sunday lunch market with our unique take. As was said when we started this project "It'll never work" - it would be good to prove the doubters wrong again. The Pullman Buffet Car had a good day with both passengers and our ever growing regulars and Anne Walker captured a little more revenue in the EVRA shop. L J Breeze received ministrations to its water pump hoses and Mick Billings flailed the approach road to Hazelwood station site. All in all, a very satisfactory day. The Pullman Buffet would like to invite people for a trail of the new Sunday lunch this Sunday 4th November 2012. To come along for a Roast Turkey main course followed by dessert, please book online at http://www.e-v-r.com/shop/. The meal is priced at £7.95 for adults and £5.95 for ages 12 and under. Sunday lunch is pre-book only. We hope to see you on Sunday! We are pleased to announce that the 2013 special events programme is now online at http://www.e-v-r.com/events/ . You can also find the page under the 'Train Services' heading in the menu on the left. 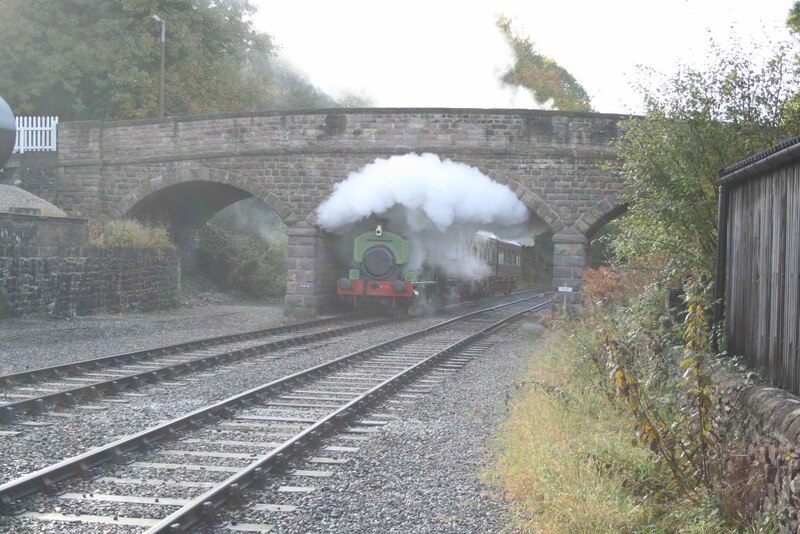 We have a couple of new interesting events in 2013, including steam at May Bank Holiday and 'Multiple Memories'. Also scheduled by popular demand after a successful 'Skiffle and Chips' evening is 'Tunes and Chips'. 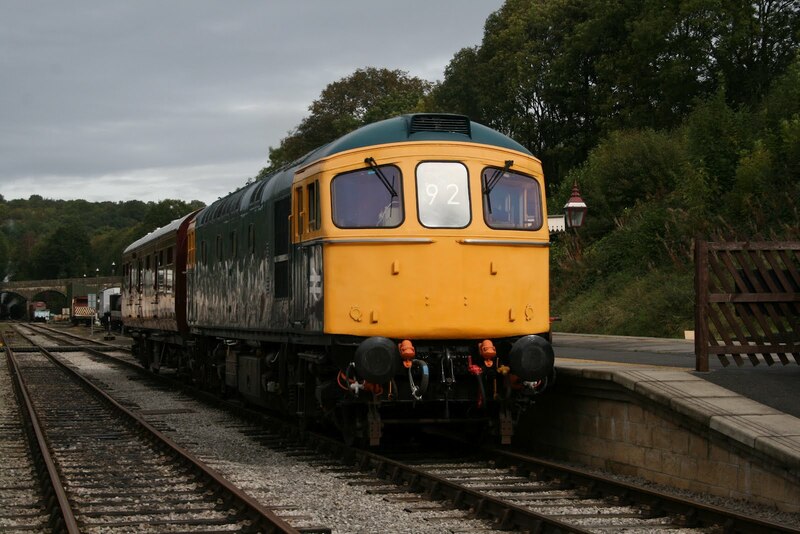 These back up the already established firm favourites such as Diesel Locomotive events, the Classic Bus Rally (which is happily back to two days) and the Classic Transport Weekend. We will be operating our normal timetable from the start of April until the end of September on Tuesdays and during the school six-week holidays on Thursdays also! The 2013 timetable, dates of operation and other 2013-related information will be published in the coming weeks. Don't forget our Normal Timetable is operating this Tuesday 30th October and this Thursday 1st November for the half term holiday! We enjoyed a warm and sunny start to the model railway weekend today attracting many visitors to the railway. This resulted in busy scheduled services throughout the day. The model and miniature railways were in operation proving popular with both younger and older visitors. Down the yard the LMSCA continued the restoration of 27001 and work also progressed on the interior benches of the LMS brake van. A lone member of the DMU restoration team carried on sorting out the stores and reported finding more items of treasure to organise. Finally, this evening's fish and chip special has again proved popular with our visitors. The Secretary of State meeting a few of the team. A very happy Secretary of State at the controls of 33035. Quite a momentous day as we welcomed the Rt. Hon. Patrick McLouglin, Secretary of State for Transport, who had the full works with the Class 33 and Royal Saloon and a photo of the scone presentation is attached. There will be more photos to follow showing real people! 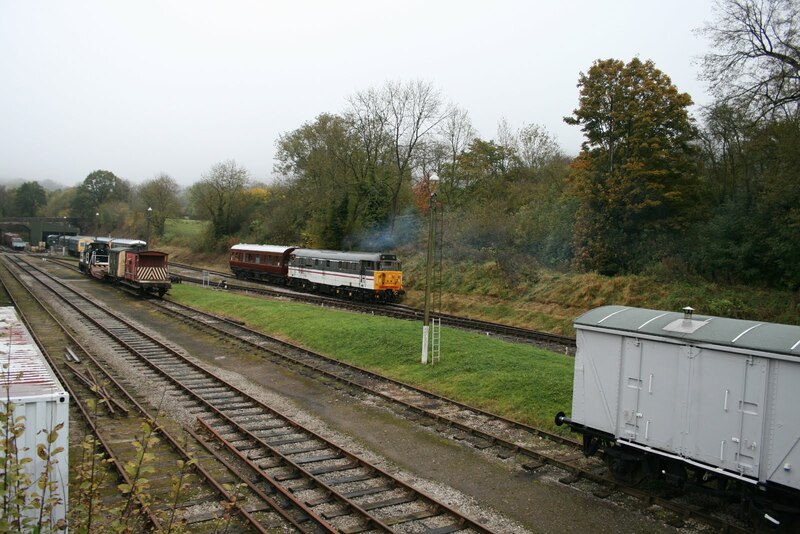 Our team responded in an extremely professional way, as would be anticipated, to deliver this prestigious visit which was the first to an heritage railway. Patrick enjoyed a journey in the cab between Duffield and Shottle and his private secretary - rail, was difficult to prise out of the locomotive. We welcomed Tom Pearson, his wife and son between Shottle and Duffield and Rupert Brennan Brown kindly welcomed us to Duffield. All in all a delightful event which I hope will have beneficial actions for our enterprise. The revenue earning department saw Mick and Bob welcoming a further four steam experience customers and much activity by EVRA to prepare for the Model Railway Weekend. The Booking Hall received our many guests and the Pullman Buffet Car had quite a number of visitors. My thanks go out to the entire team that made today so successful. Another spectacular day with a great number of tasks being undertaken in quite cold but dry weather. We welcomed Ron Whalley from the Foxfield Railway in his capacity as Assessor of our putative steam locomotive drivers. He put three of our team through their paces and we await his verdict with interest. John Evans and Joe Carver supported this extensive day and I am very grateful for their participation. The dmu team assembled the three car set which will be used over the Model Railway Weekend, fuelled the vehicles to ensure that they not only worked through the weekend but were able to deliver heat over what promises to be a quite cold period. The Class 31 was stabled and it was very good to see Tim Moore participating in this after a miraculous recovery from his entry into hospital at the weekend. 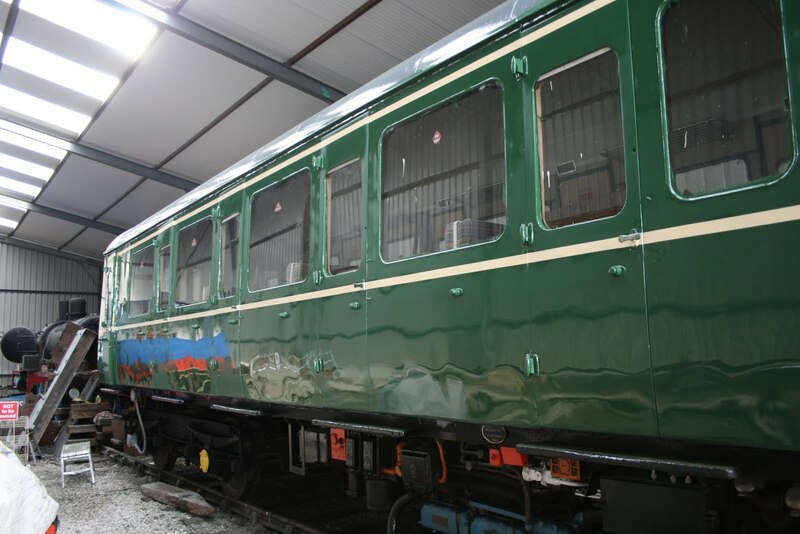 The Bubble Car team of Mike Evans and John Allsop completed the wooden surrounds for the double doors and enhanced the drivers doors as this project nears completion. Unfortunately the temperatures frustrated the application of varnish on the completed parts of the vehicle. The PWT completed their jacking and packing at Duffield together with adjustments to the pointwork there. A satisfactory conclusion to this week's work but identifying where we will have to spend more money on crossing timber renewals over the winter. The VCT concentrated on an area of hawthorn south of Shottle station reporting one very large fire to burn the brash and a six man team. The Pullman Buffet Car had a surprisingly good day as our regulars continue to increase and the Booking Hall reported an interesting statistic that Santa bookings were some 9.7% ahead of this time last year. The other fact emerging was the significant transfer from postal to on line bookings that bodes well for future offers. A busy and most productive day. A dismal, foggy day that tried to dampen the spirits but the teams today resisted depression and continued to jack and pack at Duffield and Rodney continued to undertake housekeeping jobs around the station area including some pot hole repairs in the car park. The Bubble Car project moved towards conclusion as the number was applied to the west side together with authentic "Guard" and "Private" lettering on the appropriate doors together with "blue square" symbols on the cab ends. The Lone Carriage Cleaner ensured the Royal Saloon was in tip top condition and cleansed the SK and Training Room. Chris B reviewed the condition of the Class 31 after its exertions on Monday and reported it had survived its long day without any ill effects. The Booking Hall and Pullman Buffet Car had a quiet day as weather conditions conspired to defer all but the most hardy. I had a call from Richard Flatman, a loyal member of the PWT, to explain his absence of late which was due to a triple heart bypass. His excuse was noted and he has promised to be back with us in the near future. Another photo is attached from Monday's event showing a little of our new catering offer. May be the first time a product of Swindon has visited our enterprise? Under leaden skies PWT decamped to Duffield to make a start on removing the twists in the track from the South end of the tunnel to the buffer stop including defects in cross level in the North and South cross overs. Twists are a result of cross level errors in the track and the worst kind are when the cross level error moves from one rail to the other creating a twist which can set the train on a rocking from side to side motion resulting in derailment if left to progress to dangerous levels- a stitch in time and all that. VCT have been busy at three locations- Gorsey Bank removing vegetation from a retaining wall, at Jebbs lane making fencing repairs and the usual cut and burn activities South if Idrigehay station. Mike the flail with the Komatsu was also in attendance making inroads into the lineside clearance in this area. DMU team have completed the fitting of the exhaust system to the bubble car - easy to say, not easy to do which entertained them all day. Steam Team repacked the valve spindle rods on No3 and carried on with the painting of Ellison in addition to the completion of the vacuum brake system. Despite the gloomy weather lots of volunteers doing lots of work. 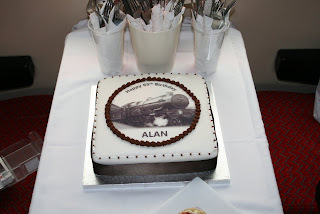 An unusually busy day as we delivered a 65th birthday charter for Alan Spencer. This was a mix of a Branch Line Society charter and the specific tweaks requested by the customer. From an early start to the day with an 0820 departure from Wirksworth to the last movement at 1710 from Wirksworth to Duffield and return leading to a conclusion at around 1830 the day worked very well. The request included use of the Class 31which allowed Vince Sakalis and John Allsop to be passed out on the locomotive. I am very grateful to Alistair Gregory for turning out at the crack of dawn to ensure the loco was ready to roll. The catering team delivered a stunning buffet and, deservedly, received a large tip that recognised the effort put into its presentation and delivery. The EVRA Shop opened at the appropriate time and the Booking Hall became multi purpose between catering assistance and collecting the money. 13 of our volunteer were involved in delivering today's event and they couldn't have been more helpful and welcoming to our guests. Many new friends have been made as a result of their stering efforts. A very lovely and almost warm autumn day here in the Gem of the Peak. to including the Quad and the Guerilla Garden. now bearing fruit in the surprising orderliness of the said stores. the length of things, to the considerable satisfaction of all concerned. A misty start to the day gave way to glorious sunshine along the valley with our trains carrying modest passenger numbers throughout the day. 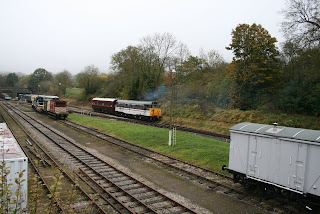 At Wirksworth the shunter's course was well attended and we welcomed new recruits on the induction course. We wish our new volunteers a long and happy association with the railway. Down the yard the DMU restoration team made remarkable progress on the restoration of the class 119 with the installation of an oil filler, the assembling of the exhaust system and the preparation of the 2nd class ceiling panels ready for fitting. The LMSCA continued their work on 27001 with the assembling of the frame supports for the steam heaters for the disabled area (photo attached) and work continued on the bench frame in the LMS brake van. Finally, the Ecclesbourne Valley Railway Association held their annual general meeting at the Red Lion Hotel this afternoon. We have been advised that Tim has had a stroke and is resting in the Royal Derby Hospital. He has some difficulty in speaking and has been encouraged talk as much as possible! Indications are that he may go home on Monday. I am sure you will join me in wishing him a very speedy and full recovery. Another delightful and productive day with four Steam Experience participants enjoyed the tutelage of Mick Thomas and Hylton Holt. Four Drive a Diesel Day clients were equally occupied by John Allsop and Richard Buckby. John Evans and Eric Hills provided the guards support that allowed a fairly large group of supporters to follow their partners and friends through the day. This team does wonders for the reputation of our Railway and all participants expressed their appreciation for a memorable day. A slight funny was one of the Diesel team presented a voucher that referred to a steam experience on the Kent and East Sussex Railway. Happily BuyaGift resolved the problem quickly enabling us to claim our just rewards. As a result of our many guests associated with the Steam and Diesel experiences the Pullman Buffet Car achieved its best Friday take of the year. The Booking Hall maintained its role of welcoming our guests and continuing to deal with the inevitable admin of further Santa bookings and a myriad of enquiries. A most pleasant, sunny, and uplifting day as we hosted another two steam charters to Idridgehay on behalf of Wirksworth Junior School as part of their local history project. This morning the weather conditions facilitated an atmospheric photo of the first train arriving to collect its young participants. A great deal of work was also achieved today as the PWT descended again on the Shottle project to pack track joints and generally level the loop line. Components were stripped from the various pieces of pointwork previously put in position at the south end of the loop so that useful parts can be recovered. The VCT responded to an appeal by our bridge and structure examiners to strip vegetation from a wall at the Cromford Road end of the incline, under Cemetery Lane and the south end of the Wash Green bridges. Good progress was made and we can say we have done what was requested. 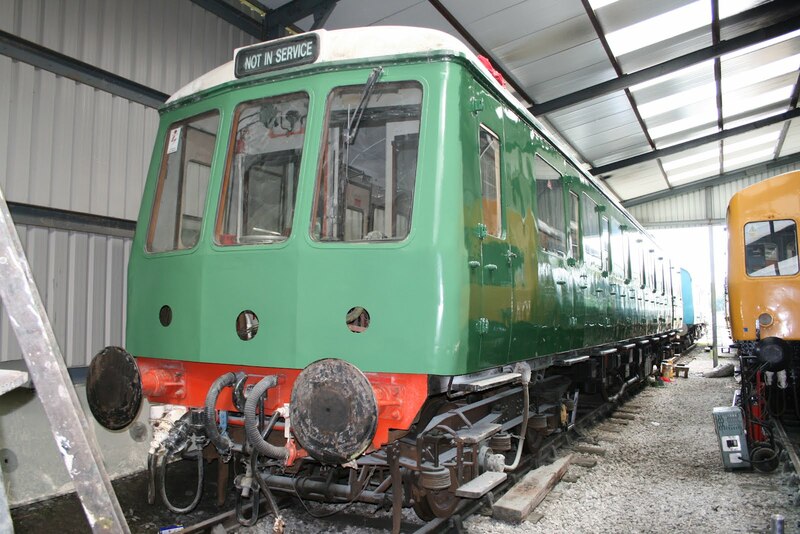 The dmu team achieved much work including a replacement water pump on the Bubble Car, minor repairs to a heater on Iris and the start of a deep clean of the interior of the Bubble Car which has had its first Lion and Wheel crest applied. The Booking Hall processed more Santa bookings and continued work on the proof of the 2013 timetable leaflet. The Pullman Buffet Car reported quite a successful day from passing trade including yet another contingent from the Whitwell and Reepham Railway. Apparently we have hosted their entire workforce over the last couple of days but, then again, there were only eight of us when we started! A most pleasant and quite warm day enabling further significant progress to be made with the "Bubble" car. A photo is attached to illustrate the paintwork gleaming! Craft enterprises had another long day tending to the Royal Saloon's interior woodwork and window mechanisms before its next excursion tomorrow. The Lone Carriage Cleaner cleaned up after Craft enterprises and checked the Second Corridor (SK) is still in good shape as the Head of Gardening began to deal with our neighbours debris. At our southern extremity there was spirited hand pulling of weeds and ash saplings from the track bed. The eagle eyed LCC spotted a small group from the Whitwell & Reepham Railway who were touring our site for constructive ideas. Needless to say they were made very welcome. The PWT concentrated on the Shottle loop project as we near the time the track can be slewed to allow the platform to be reconstructed. The Booking Hall and Pullman Buffet Car benefited from the footfall brought out by the unseasonable good weather. Back to normal with the home computer springing to life again enabling these ramblings to be fuelled by a modest infusion of Scotland's finest. Maybe it will be duty free after 2014. Another record number of participants in today's activities with Henry Ellison receiving more preparation for its final top coat and the LMSCA steadily working through welding repairs to the north end of the vehicle. The Royal Saloon had further attention to its plumbing with a declaration of success after quite a difficult process to expose the pipework that had failed. The VCT continued their quest to improve the fencing in the Jebbs Lane area with a three fire day to be outdone by the PWT who had a five fire day to deal with their redundant material. All this effort should keep the frosts at bay. The dmu team spent the day restoring the Bubble Car guttering as this vehicle approaches completion. On line Santa bookings continue to arrive with vigour and the Booking Hall continued work on the 2013 timetable brochure together with fielding an undeminishing number of phone enquiries. The Pullman Buffet Car welcomed a reasonable number of visitors. All in all, another good and productive day. which, given the length of the station fence, will take some time yet. be technically accurate, it was inspected by a welder. in the stores, as opposed to be sort of nowhere in the stores. quite bored in their pubs on a Sunday. A pleasant day at Derbyshire's favourite branch line with moderate visitor numbers. The Wirksworth yard was a hive of activity with a large contingent of DMU restorers organising themselves into three teams. Team one set about the class 119 resulting in number two engine free wheel and angle fan drive being fitted together with both gearbox air pipes. Team two carried on restoring the bubble car lining out and painting the under frame with team three concentrating on tidying up the stores. Intrior restoration of the of the LMS brake van continues with the fitting of the new bench frames (photo attached). The LMSCA were busy preparing the BSO in readiness for welding work next week. Finally the Pioneer Diesel Group successfully tested the saloon's ETH. A wonderful, sunny, day showing off our Railway at its best to our Steam Experience and Drive a Diesel Guests. John A and Richard B guided the diesel participants and Mick T, JHT and John E looked after the steam folk. The weather also brought out a goodly number of people to sample the delights of the Pullman Buffet Car. Anton ground on with the Santa mail out and the surprise arrival of a young offender and minder lead to some fence painting being achieved. Late news from the VCT reports that they had a record five fire day south of Jebbs Lane yesterday and are on the last lap of this job. PS – I attach a set of photos from Birmingham University which form a nice record of their achievements in September. They have already booked to come again in 2013! Mike and Joe continued their project to sort the plumbing out in the Royal Saloon with some success. The dmu team checked the service 2 car set and undertook some running repairs to the first class section on 51505 where some weighty people seem to have sat on the armrests. Progress was also made with the “freewheel” on the Class 119 vehicle. The PWT undertook a range of snagging jobs at Wirksworth including repairs to a gate lock at Gorsey Bank, manufacture of lift fishplates and the fitting of stretcher bars to the Wash Green ballast dock pointwork. The VCT were in action somewhere! The Booking Hall processed some Santa bookings as that product comes to life and the Pullman Buffet Car had a fairly quiet day. I am catching up with the daily reports which I normally do from home in the evening. However, my internet connection failed on Wednesday and, despite repeated and very lengthy calls to India, the best BT can suggest is that service may be restored on Monday! Tony, Hylton and John completed the fortnightly track patrols whilst the rest of the PWT doted their attentions to a varied day. They transported and unloaded the life expired sleepers from the Cemetery Road relay to a site where they may rot in peace. The Rudd was filled with the last of the recoverable ballast from the former Gorsey Bank line and transported to Shottle for the loop project and two wagons were filled with logs for sale at Wirksworth. The Head of Gardening continued with the Wirksworth bank garden dealing with debris thrown over the fence by an ever helpful neighbour! A start was made on assembling the annual Santa mail out and the Booking Hall dealt with a number of visitors brought out by the unexpected good weather. The Pullman Buffet Car had a good day thanks to the influence of Norfolk Dave bringing his walking party for lunch and Mike Billings treating Mrs Billings. Another most pleasant autumnal day that puts the world of Derbyshire in context as a good place to be. The track patrols of Tony, Hylton and John ensured there were no alarms for our trains and the remainder of the PWT gathered the last of the ballast from the former Gorsey Bank line for use at Shottle. This ballast was loaded to the Rudd and the works train progressed to Shottle to unload sleepers that will be left to rot in peace and gathered a very useful two wagons of logs for sale. The Head of Gardening was present to work on the Wirksworth station garden and deal with some detritus sent onto our patch by a helpful neighbour. The Booking Hall team began the task of assembling previous years Santa customers ready for a mailout to remind them we are still here. The Pullman Buffet Car had quite a good day with many thanks to our members that resulted in a walking party of 14 and a couple of 2 adding to the reasonable number of visitors brought to us by the good weather. A bright and sunny day brought out volunteers in their droves with P Way collecting up all the remaining displaced sleepers along the line, shunting coaching stock, remaking the facing point lock on the ballast dock and 4 members attending a morning course on track patrolling courtesy of Bob Swepstone who also donated a bundle of p way tools. Better half Swepstone aka filing fairy was also in attendance making further inroads into our paper work requirements. VCT were out and about at Jebbs lane with 2 fires and more fencing work completed. LMSCA were making further inroads into the LMS coach restoration cutting out bits of body work etc. DMU team were about the bubble car paint job with the North end receiving it's second gloss coat, west side top line, South end both lines, South end small warning panel and the guards compartment ceiling receiving it's second coat of gloss. Passenger dept had a meeting regarding this years Santa trains. Steam team had a busy day attending to the washout of No 3's boiler along with repairs to the fireman's side clack valve. Ellison had further paint applied and more pipes added to it's lubrication system. Mike the flail spent time on the incline trimming back the banks so they look nice and tidy. Alone worker attended to the painting of new signs at Duffield. The buffet and booking office had a few visitors and that's about it I think. Checked the signing in book today and there were 54 volunteers on site- a very impressive performance. A quiet, sunny day in the Ecclesbourne Valley featuring a charter for ex RAF personnel who meet once a year and had chosen us amongst their destinations this year. They were very ably hosted by David N, Andrew O and Richard B on their journeys to Duffield and Ravenstor. Travelling at ground level many of the party enjoyed views from the driver's perspective that added a little extra to their time with us. Rodney was in action at Duffield making some more road signs to guide people to our enterprise. The Booking Hall and Pullman Buffet Car played their part in welcoming our guests. The FF and her assistant were present as their domestic printer prevented Bob creating his course notes for tomorrow. All now in order for the Track Patrollers Course with its high standard of handouts. Todays sunshine coupled with the changing colours of Autumn, helped to create beautiful vistas along the line for our passengers to enjoy. Visitor numbers were good and we welcomed a contingent of families with young children resulting in the 11.10 Duffield to Wirksworth service resembling a creche. At Wirksworth both the LMSCA and the 8F Group held their respective Annual General Meetings. Our lone gardener Lynette was spotted tending to the shrubs on the bank next to the miniature railway. The DMU Restoration Team set about the class 119 with the guards compartment receiving a thorough clean out and all the first class seats were dry cleaned and placed in position ready for installation. 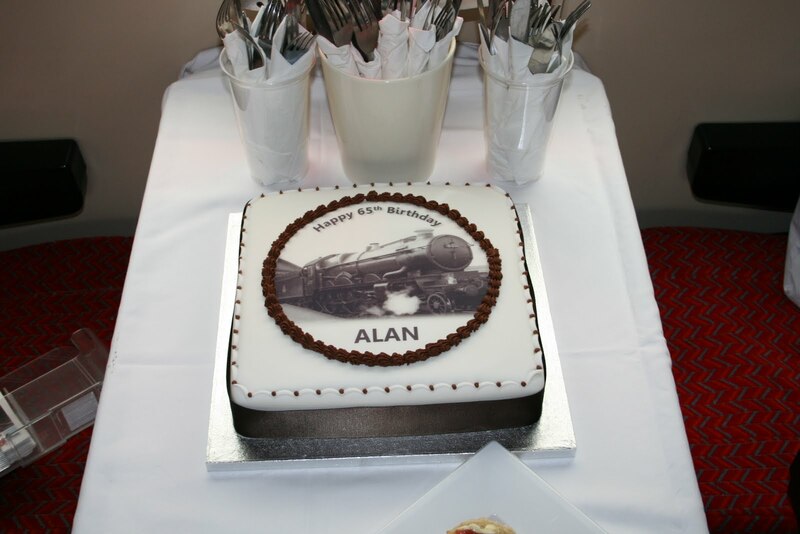 (photo attached) Congratulations go to Mr And Mrs John Gratton who are celebrating their Diamond Wedding Anniversary with family and friends on their own steam charter this evening. Finally, my personal thanks for all the get well messages I received during my illness. Its good to be back. A most pleasant and productive day with four participants for our Steam Experience Day very ably hosted by Neil, Fred and John. One of the visitors was most fulsome in his praise as he felt the team had moved above and beyond their duties. Happily they always do! There was the first meeting of our Safety, Heath and Environmental Advisory Group which had the by-product of the Filing Fairy being operational as she chases down our paper trail of requirements. John Allsop has tended to the "Bubble Car" as the lining out commences ably assisted by Vince Morris who happened to be passing by. He is now a fully qualified string holder and can take credit for the straightness of the lining. After our steam experience day we welcomed "Inside Track" for a charter with Iris. Angela warmed with tea and coffee, Richard took them on a yard tour and Graham, Andrew and the rest of the team took them to Duffield and Ravenstor. Pat opened the EVRA shop which was appreciated. The Booking Hall received our visitors and had quite a good revenue day. We were again blessed by sunshine over our enterprise that allowed the PWT to make good inroads to the restoration of the pointwork into the Wash Green Dock. Once this project is completed we will be able to accept ballast deliveries again directly into our Dogfish hopper wagons. This is not to say these deliveries will happen until sufficient funds are present to pay for them! There was much activity to prepare the dmu fleet for this weekend's demands and the EVRA shop ramp was renewed after it was found to have deteriorated quite badly. Pat was preparing for one of her major selling events at the Mickleover Model Railway Weekend and a great deal of her stock was prepared for transport there. The VCT returned to the Jebbs Lane and made further inroads to fencing repairs there. It was good to see Tom Tait back amongst us after quite a life changing illness reflecting on the what is really important and quite obviously Railways won! The Pullman Buffet Car had quite a successful day with passing trade that grows each week and the Booking Hall welcomed a number of customers in addition to updating the mytesttrack web site. A most pleasant and sunny day as we start to wind down for the winter period which will feature a lot of maintenance of our vehicles and infrastructure. The dmu fleet were winterised by the addition of anti-freeze to their coolant systems. A mini crisis in catering this morning as were learnt that Amanda had broken a finger moving a cooker at home which sounds very painful. Angela stepped into the breach and opened up to the delight of quite a few visitors. For those that might be interested, a number of catering opportunities have been placed on the Job Centre web site so that we can trade with confidence through the winter. David N has been snagging in the Pullman Buffet Car and completed the fitting of a lobby light in the guards compartment together with a little more security of the vehicle. With very limited funds we are trying to ensure the catering operation can trade through the winter for the benefit of our volunteers and occasional customers. Encouraging progress is being made with this objective. The LCC gave our "steam set" of the SK and Royal Saloon in time for the John and Enid special on Saturday to help them celebrate their 60th wedding anniversary. The Booking Hall continued solid progress with promoting our products and masterminded a meeting with our internet supplier which, amongst other things, will enable customers using the Training Room to experience wi-fi. This is quite marketable and my thanks to Leigh for moving the project forwards. More rain, more rain and more rain failed to prevent works of all kinds today. P Way bagged up 16 tons of chippings into 1 ton and 1/2 ton bags that were donated some while ago. The chippings are for packing the track to remove dipped joints and twists in the cross level. Said bags were then loaded to the flatrol for use along the line which is the most convenient way of transporting them around. A start was made on rehanding the switches to the ballast dock siding - these having been laid in a bit of a hurry some time ago which resulted in less than ideal alignment. Trusty rail bender earning it's keep again, however, the operators are less enthusiastic - a useful bit of kit but then every silver lining has cloud. LMSCA were about it again today on the LMS coaches after a brief interlude with property development in Belper. Mike Evans and John Allsop applied the final top coat to the west side of the bubble car and undercoated the North end. VCT cruised up and down the railway in their landrover to get diesel and a few bits and bobs with further completion of fencing work before being rained off. Steam team were around in abundance with No 3 cleaned and coaled and investigations into a hot running axlebox. Ellison had more vacuum pipes added with more blue paint applied. in readiness for loading up everything 2 by 2. Jenny has been hidden in the steam but you will wish you had been there. A day of great self satisfaction as everything we did had a purpose, revenue created and a warm glow for our enterprise. There was an early start for the steam crew as they prepared No3 for an adventure to Idridgehay taking our compartment coach (SK) and the Royal Saloon to collect the pupils of Kirk Ireton Junior School for a re-enactment of a wartime evacuation. As they steamed into Wirksworth the resident air raid warden awaited them and the children went off for rations at Wirksworth Junior School. 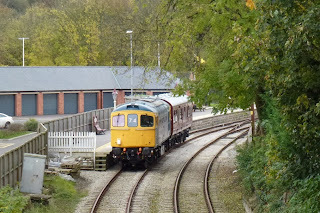 The Royal Saloon was then gathered for a charter commisioned by the Environment Agency travelling to Duffield and then making a run back to Wirksworth stopping at the various crossing points of the River Ecclesbourne. 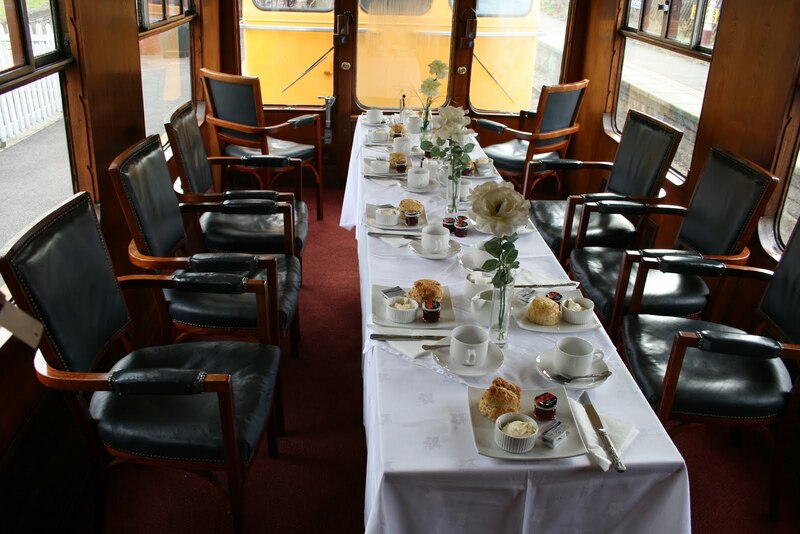 The catering team provided a buffet lunch on the Saloon that seemed to meet the client's requirements admirably. On return of the EA charter the Evacuation Special was reassembled for the return journey to Idridgehay. Back at base the Booking Hall, Pullman Buffet Car and EVRA shop were in action to deal with these charters and a number of other visitors that came to see us on a Monday. David N, before his train crew duties fixed a new water heater to our ladies toilet. I am immensely grateful to the steam team of Mike Ball, JHT and Will Fry who were up and about very puntuctally, Graham and David N who dealt with the EA charter using the Class 33, John Evans and Richard Buckby who looked after both charters as guard and third man together with steward Mike Craft who ensured our EA guests were fed and watered on board. The Catering Team deserve praise for providing an attractive buffet lunch loaded in some haste during our crowded schedule today. Everything went extremely smoothly due to the proffesionalism of all concerned. PS a photo of the EA special is attached.